Apple’s new iPhone has a large-size screen, especially the iPhone XS Max, with a screen size of up to 6.5 inches. The bigger the screen, the higher the risk of breaking. If the screen is broken, you can go to Apple’s shop repair, but Apple’s maintenance costs are very high, nearly 400 dollars, for security reasons, it is best to buy an iPhone XS Max case. 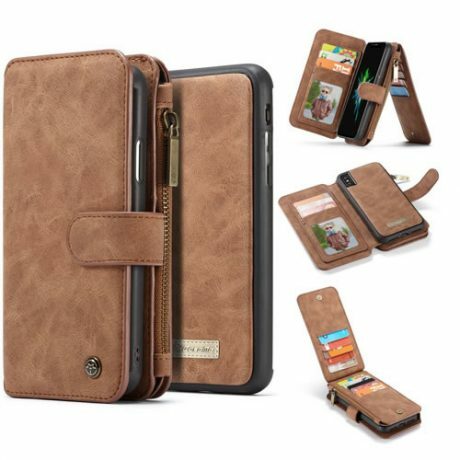 CaseMe iPhone XS Max Wallet Case, Why do we recommend this case? The first thing you will notice is the neat workmanship. It is made of high-grade PU leather and is very delicate. Thanks to the smooth appearance, you can easily hold the device. 14 card slots and a zipper pocket open all essentials. There is also a magnetic strap that allows you to easily open and close the case. There are also iCarer iPhone XS Max Leather Case and BRG iPhone XS Max Zipper Wallet Case, which both provide good protection for the iPhone XS Max, falling from 6 feet without damage.